The winged figure of Victory seated on a pedestal and holding a palm branch in her right hand and an olive branch in left. Beneath the pedestal is a rectangular base bearing the word “WATERLOO” and beneath this, in two lines, the date “June 18 1815”. Above the figure of Victory is the word “WELLINGTON”. The disc of the medal is silver. The original suspension is steel. Approx. 38 mm wide, crimson with dark blue edges each approx. 7 mm wide. Originally issued with a steel ring approx. 28 mm diameter which passes through a hole in a steel clip approx. 2 mm wide that grips the rim of the disc. 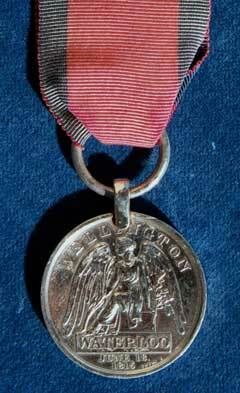 On many medals this suspension has been replaced either in whole or in part by suspension of a different pattern. Always in large impressed Roman capitals, with the spaces at either end filled in with decorative stars. 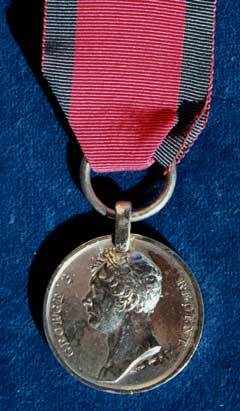 This was the first medal to be awarded by the British Government to all ranks present at an action, the Waterloo Medal was awarded to all who took part in the battles of Ligny (16th June); Quatre Bras (16th June); and Waterloo (18th June). In addition, every British soldier present at any of these battles was credited with two years extra service, which counted for all purposes, and was a ‘Waterloo Man’. It was at Waterloo that the French Army under Napoleon Bonaparte was finally defeated by the British Army under the Duke of Wellington and the Prussians under Marshall Gebhard von Blücher. After three years of arduous active service in Portugal, Spain and France the 1st Battalion, then camped near Bordeaux, was selected to form part of a force of “the best and most experienced regiments” to sail for North America under the Duke of Wellington’s command. The King’s Own along with the 44th and 85th Regiments were the first detachment to sail, on 2 June 1814. Actions were fought at Bladensburg, leading to the capture of Washington, and at Godley Wood - both ended in victory. An attempt to capture New Orleans towards the end of the year saw the Americans triumph. The King’s Own alone suffered over 350 casualties in the battle. Following the peace agreement of February 1815 the Battalion returned to England arriving at Deal on 18 May only to learn of Napoleon’s escape from Elba. The Battalion was re-equipped and brought up to strength with men from the 2nd Battalion and landed at Ostend on 12 June where it received orders to join Wellington’s Army near Brussels. Marching immediately to Ghent it joined the 10th Brigade under Sir John Lambert (4th, 27th, 40th and 81st Regiments). Having been initially out manoeuvred by Napoleon, Wellington and Blücher sought to concentrate their forces and Lambert’s Brigade (less the 81st) was ordered to march towards Brussels. By marching forty-eight miles in thirty hours The King’s Own reached the field of battle at 8.30am on 18th June with Band playing and Colours flying - the first Regiment recently returned from America to arrive. The Battalion was brought up from the reserve in the afternoon when it came into the line opposite the gravel pit near the farm - La Haye Sainte. Out of a strength of 669 all ranks its casualties totalled 134 killed and wounded.